Once the Cloud Connect infrastructure is completely configured, license is in place, and hardware plans have been created (for replica services) a service provider can start to configure users and accept their incoming backups or replicas. 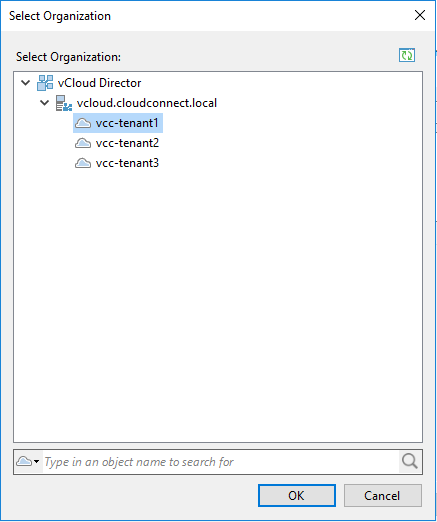 In the Cloud Connect node, select Add Tenant to start the customer creation wizard. 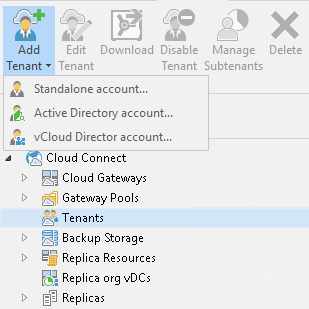 A tenant can be a Standalone account which uses the local Cloud Connect database to store credentials, or a vCloud Director account which uses existing vCloud Director organizations as Cloud Connect accounts. 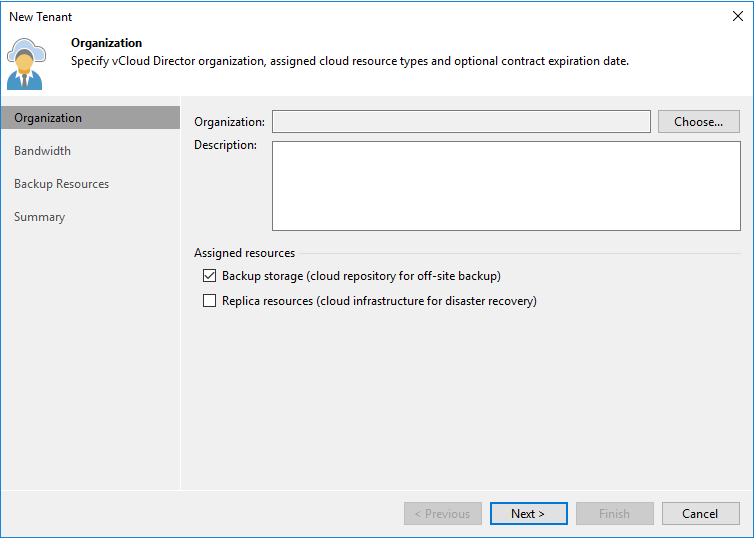 NOTE: vCloud Director accounts can be used also to offer backup services. 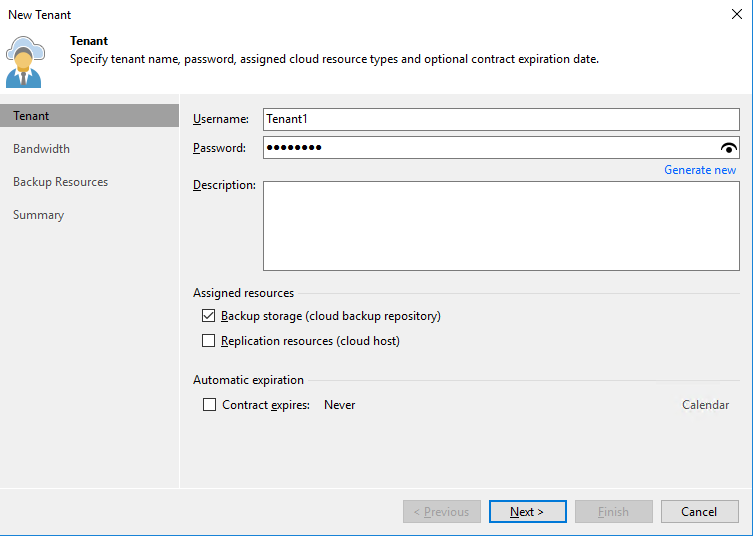 A customer of the service provider is uniquely identified as a tenant, and thus it can rent both backup and replication resources, and connect to them with the same credentials. For this reason, both options are grouped in the same section of the configuration process. 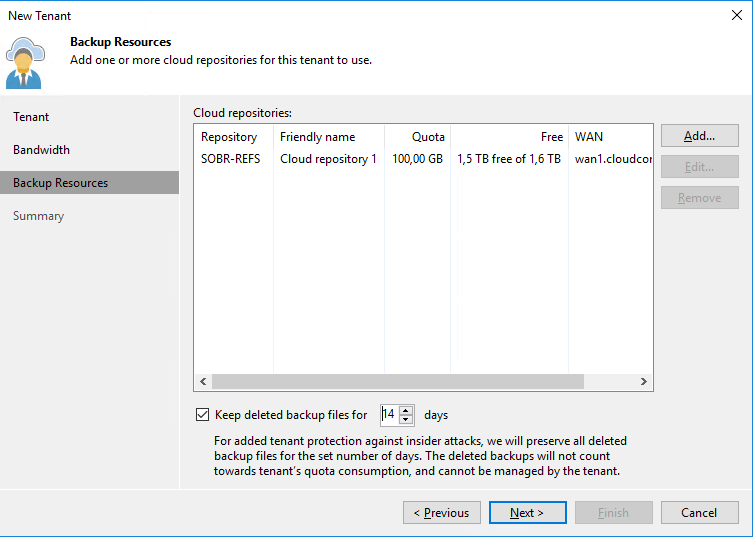 In this first step, we are configuring backup resources; later we will also assign replication resources to the same tenant. 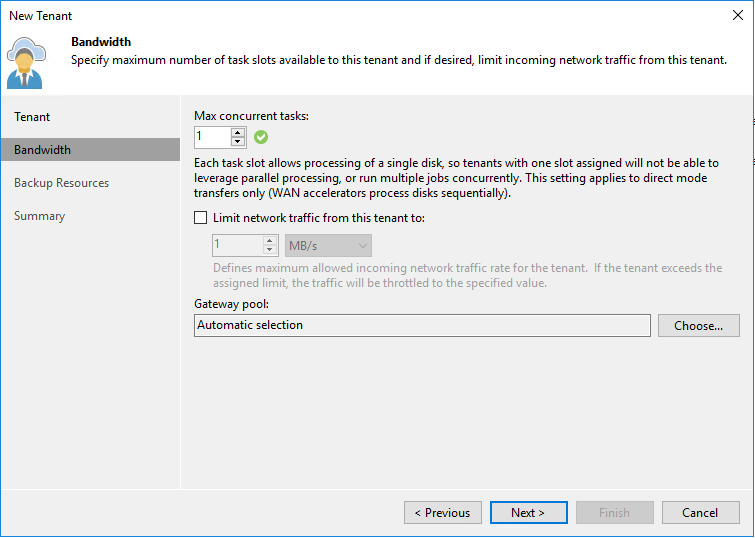 We described in details how concurrent tasks limits work in Veeam Cloud Connect in chapter 2.7, please refer to this chapter. Bandwidth is an optional parameter that can be applied to a tenant, and it will limit the amount of traffic the tenant can generate. The bandwidth available to one tenant is equally split between all tasks performed by this tenant. Please refer to chapter 3.5 for additional details. In the backup resources step the service provider can also configure Insider Threat Protection, as explained in details in chapter 3.8. The service provider completes the wizard, and the tenant is ready to consume the assigned backup resources. 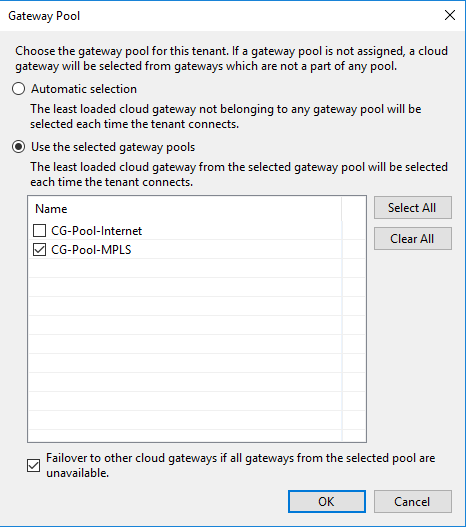 At any point in time, the service provider can edit the tenant configuration, and modify any parameter. 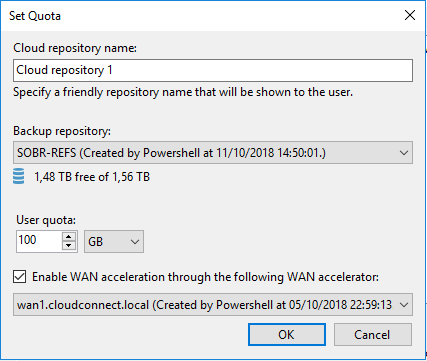 If vCloud Director is used, service providers can use its users to authenticate and authorize Veeam Cloud Connect tenants, for both backup and replication services. The following steps are the same as for Standalone accounts. We will see more differences in the following chapters, when talking about replication resources.